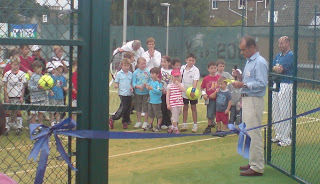 Above : Yesterday I was delighted to attend the opening of the new tennis courts at the West End Tennis Club. A really good turnout of local people – here’s some of the crowd at the opening! 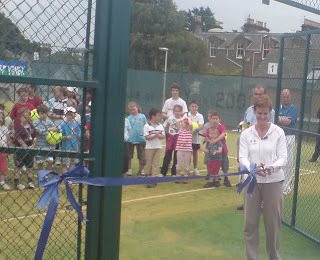 Above : Judy Murray cut the ribbon! 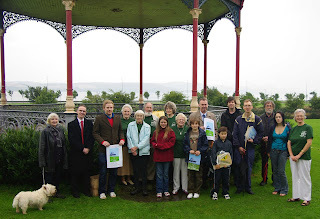 Above : Today, the Friends Of Magdalen Green launched their super 2009 Calendar – here’s us all at the launch at the bandstand, together with some of the competition winners. You can read more at : www.magdalengreen.btik.com Above : Later this afternoon, as the City Council’s Planning & Transport Convener, I was pleased to give a welcome speech to delegates from this year’s UK Planning Summer School at the University of St Andrews. Delegates – councillors and planning officers from all parts of the UK – were on a tour of Ardler to see the success of the regeneration. 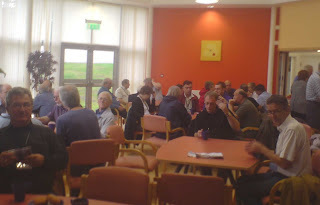 Here’s part of the group having a welcome cup of tea and shelter from the rain at the Ardler Complex.